Cinderella, please report to the team bus: Game Over! Tournament darlings Cornell, Northern Iowa, and St. Mary's return to the storybook they came from, and names like Farokhmanesh and Samhan fade, order has been restored heading into the 'Elite Eight.' Less than twelve hours before tip-off on Saturday afternoon, it's time we bite off our piece of the tourney . . . 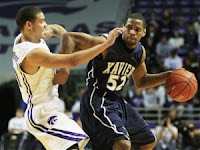 If this was American Idol, the judges would use their power and bring back Jordan Crawford and the Xavier Musketeers. Led by their sophomore guard, Xavier pushed the second seeded Kansas State Wildcats to two overtimes and within seconds of the tournament brink. Not since Jake LaMotta have we seen someone take as many hits as Xavier took and not fall over. Guard Terrell Holloway buried three game tying free throws in one of the most pressure packed situations you could fathom. Down 87-84 with seconds remaining in the first overtime, Crawford nails a game tying three-pointer. For two halves and two overtimes, rarely did Xavier not come out fighting every time the bell rang. Combining for 58 points, Holloway and Crawford strapped the Musketeers to their back and refused to quit in one of the most exciting games we've seen. In a losing effort, none was more impressive than Xavier, hats of in their first season of the post-Sean Miller era. I've said it three times now, Bruce Pearl's Tennessee Volunteers are the only team which can boast wins against both Kansas and Kentucky this season, so why are you shocked their in the 'Elite Eight'? Add the 29-win Buckeyes to their hit list. Watching the Volunteers up close in this tournament your left thinking just one thing, they're as good as anyone. 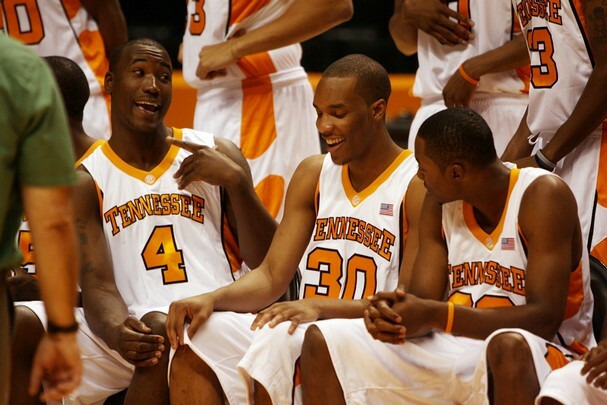 Led by senior Wayne Chism, Tennessee plays with a chip on their shoulder and the swagger of a team that fears no opponent. Sound like another SEC team? As Ohio State and Evan Turner watched their Final Four dreams fall short on Friday night, Tennessee advanced to the furthest their program has ever been. Out rebounding Ohio State 36-23 gave Volunteer "bigs" Chism and Brian Williams a ton of second chance opportunities, something they've been doing all year long. If Bruce Pearl has been waiting all season for this team to mature, they are doing it at the best possible moment. After smacking down two straight schools from the state of Ohio, Tennessee takes aim at traditional tournament heavyweight Tom Izzo and the Michigan State Spartans. Yes, they might just be headed to Indianapolis. The legend grows in Lansing, doubt Tom Izzo in the NCAA Tournament? Never again. As the CBS brass sat on pins and needles dreading a Northern Iowa Final Four appearance, the Spartans took care of business. Down one near 15 ppg. guard, Michigan State shook off the doubters and sent Northern Iowa packing just one week removed from their upset victory over the top seed Kansas Jayhawks. Durrell Summers and backup guard Korie Lucious picked up the Spartans and outscored Northern Iowa guards 29-12. At this point, who is going to bet against Michigan State when it comes to big time tourney games? They don't lose. In the wake of their buzzer beating victory over Greivis Vasquez and the Maryland Terrapins a week ago, almost immediately people were hitching themselves to Northern Iowa given the injury to Spartan stud guard Kalin Lucas. Now what do you do? A surprise Final Four appearance a season ago, and now on the cusp of returning, Michigan State is cementing themselves as THE tournament heavyweight, if they aren't already. Quick note: The Spartans success can be directly linked to their play on the glass. Michigan State has out rebounded each of their tournament opponents to a combined total of 103-73, for you math majors that's 30 more rebounds than their competition. Ball game. How good is Duke guard, Jon Scheyer? Clearly he doesn't garner the same respect as players like Kentucky's John Wall or Ohio State's Evan Turner, but after watching Scheyer take control on Saturday night, he has left me wondering. Is Scheyer as good as I'm beginning to think? The 4-year Blue Devil could be dubbed Mr. Intangible. He can handle the ball, slow the game down, pass, rebound, and scores when he needs to. In their win over Purdue, Scheyer did a little of everything. Five rebounds, including four defensive boards, four assists, eighteen points, and a steal. What can't he do? Scheyer's impact on the game is immeasurable. Friday night was just a regular night for a player who averages 18 points, 5 assists, and 4 rebounds a night, these are the games he turns in. No matter where Duke plays, they're the most hated team on the floor, similar to the Yankees, Lakers, and Cowboys, Duke is the college basketball equivalent and Scheyer loves every minute of it. The more we sleep on Duke and Jon Scheyer, the more dangerous they grow and based on their careful disection of both Cal and Purdue in this tournament, they are growing quick. Seconds left, National Championship on the line, my ball is in the hands of Jon Scheyer, nuff said. Calipari v. Huggins, Whoa! Did the committee have this match up in mind when they seeded the Syracuse Regional? The SEC Champs v. The Big East Champs, John Wall v. Da'Sean Butler, and John Calipari v. Bob Huggins, two of the games finest. When West Virginia (2) squares off against Kentucky (1) let the fireworks begin. Anytime the winner of a game becomes the favorite to win the National Title, I'm all in and that's where we're at. Neither of these two have had much in the way of a close call throughout the entire tournament. 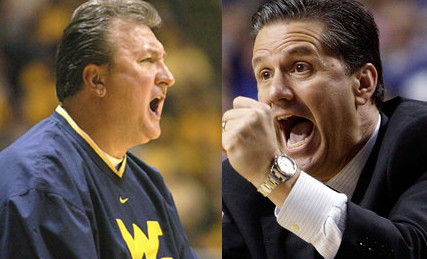 To get to this point, both West Virginia and Kentucky have all but cruised to victories. Kentucky dismantled any hopes Cornell had of advancing with a 17-point victory. West Virginia handled Washington with a 13-point victory. The only region that comes down to a (1) v. (2) is bound to give us a great game. Calipari looking to reach the Final Four in his first year in Lexington and Huggins looking to lead his Alma Mata to the Final Four. Both of these programs are about to reach the next level on the games biggest of stages. Salt Lake City Regional: Butler will crash the Final Four party, Kansas State suffers the wear and tear of Thursday night less than 48 hours later. St. Louis Regional: Tennessee cuts down the nets and heads to Indianapolis leaving Michigan State in their path. Wayne Chism shows up yet again in a big way. Houston Regional: Baylor knocks off the Blue Devils, on Friday night the camera flashed to former tourney hero Bryce Drew in the crowd watching his brothers Baylor Bears shut down St. Mary's. It's a sign, Baylor is the team of destiny. Syracuse Regional: West Virginia drops John Calipari and the Wildcats of Kentucky. You don't leave two programs with vacated victories and go unpunished by the basketball gods.